I am writing this blog to share, vent, diffuse…so many reasons or excuses, you decide. I am a teacher as most readers know, so I am now in the 5th week of my summer break. Traditionally a time to spend with family, relax, let go of school thoughts, go away for a while, then wind self up in the last week as I prepare to go back into school. This summer is my new beginning, a move to a dream job teaching, not managing others, with chances to be creative and outdoors. An opportunity to bring my extended family together in a new place in a great location. That is all still going to be possible so why is it getting to me? Well complications over selling and buying properties and delays … mean that the choice to be in our new location for the 9th of August has been and gone. The various companies involved in the reason for the loss of one sale are being elusive. The follow up process not moving at the speed we would like. It is causing frustration. As part of the interim measure four of us share our three bedroom terraced house, space is at a premium, there is nowhere to hide for those moments on tension. I have had many good points this holiday, many spent with family, ex collleagues, ex pupils celebrating the start to a new stage yet my mind and body roll from one extreme to the other. I am participating in #DrawAugust where I sketch (at least one) a drawing each day and post it online – I am doing this on Facebook and Twiiter where I am combining it with #Teacher5adaysketch. 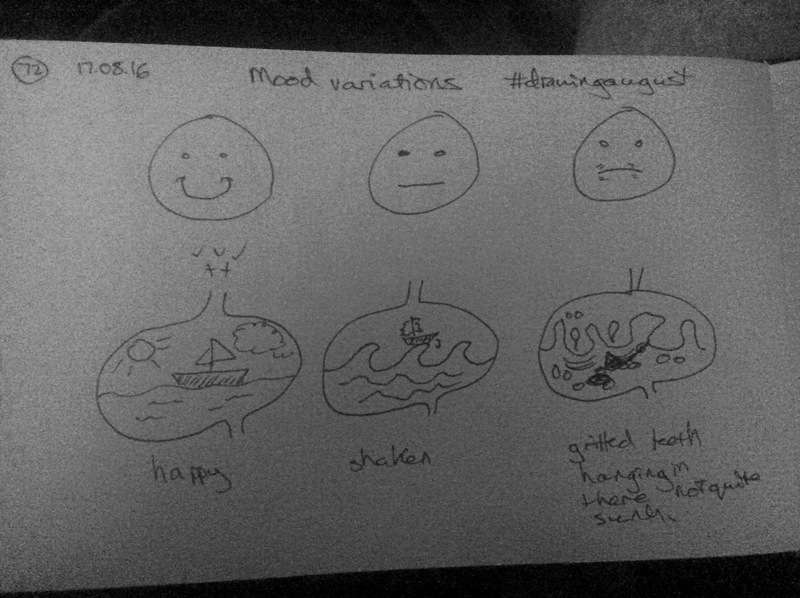 Today’s drawing shows how my mood has varied today. I have had the happy smiley, finding it difficult to take compliments about the way I work with my classes. I have had the neutral where despite nagging doubts about the pace of progress towards the new life I have offered the whole family, not just myself there have been great thoughts that neutralise or even balance out the mood. Then there are the silly things I allow to niggle away, the gnawing and gnashing of my jaw in frustration where my mood drops and my boat seems to start sinking. So why post this, because to be honest blogging is my release. It doesn’t matter whether people read it, it is like a tap. I can alter the flow. When I was younger and I felt low I would bottle it up, I wouldn’t share and I would fly off the handle and get very shoutey, I would slam doors. I was not great to be around and I apologise to my siblings and parents for that. Those outlets didn’t make me feel better. I have used exercise, sketching, walking, crying, hiding in a darkened room to various extents to release the internal pressure. I reflect I have a mind which is overactive, I don’t always advise such a thing. So today as the day has progressed, I am not in the mood to exercise, I want to hit out but I don’t, I want to scream but I don’. I want to hide but I don’t – so I blog and I will post it once on FB and Twitter as a link and it will stand as evidence of one day in my head. Some say I shouldn’t be this open but I suffer from depression I have a Mental health issue and I want others to know that it is not easy on some days. This August the 31st I am going to host an online chat as part of #teacher5adayslowchat3 and talk with people online about this mental health thing that impacts on many of us, that makes others judge us. Then on September 17th I am opening myself up in a room with other people, mainly teachers ( nobody might turn up) to have a conversation about mental health from the teachers perspective as the sufferer rather than the supporter. As I have written this post the therapeutic effort of putting my thoughts down by drawing, then typing (and correcting) have brought me to a calmer place. If you have read to this point, thank you. If issues like this affect you and you don’t have an outlet say hi – I am on Twitter at @aknill, I am on email at Andy.knill@gmail.com. If that scares you, I am sorry and ignore my offer. I am now back to midway between picture two and picture one. 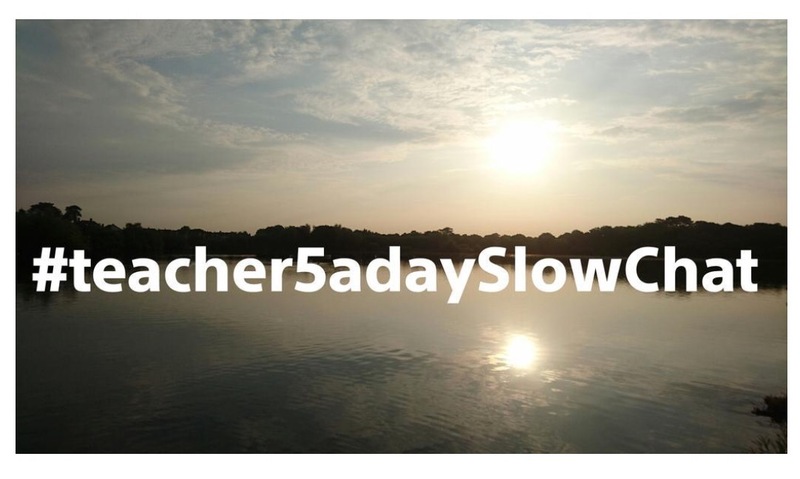 On Wednesday 31 August I will be leading a #Teacher5adaySlowChat on Twitter on this topic as a lead in to a new school year and also as a link to my session at #Pedagoohampshire16 on 17September. The slow chat offers an opportunity throughout the day for people to reflect, challenge, ask, share what I mention in this post based on the questions I am going to post here. I am NOT an expert on mental health, I am a person that suffers from the effects of my own undulating mental state at different periods of my life. I have blogged quite openly about this now for a number of years, taken part in projects looking at people who have ongoing unresolved issues, chatted to people at open events about it and also shared thoughts with others online. So why do I think my perspective might help others at a teacher meeting aimed at well-being as a new school year starts. Why me to promote a discussion about mental health before term even begins? In the media and through online networks mental health has become a much more openly discussed consequence of modern life and how we cope with it. Some people are never troubled, some can not work at all, some have problems from time to time. As edipucators we are increasingly seeing more signs of stress in our pupils and colleagues. Some schools have very clear and explicit support mechanisms, sometimes these target both staff as a resource as well as students. Sometimes one group is dealt with more effectively. Sometimes it seems for some that it is an inconvenience and people should just snap out of it and get on with life. We can all cite differing views. I believe that students and staff both have needs in terms of support and understanding. My outspokenness in the minds of some former employers make me a thorn. I have a profile online for speaking out. It is not for selfish reasons although that could be aimed at me because my own mental wellbeing is of course on my agenda. Q1 Are you aware of mental health being an obstacle for some students and /or colleagues? How are you aware? Q3) Does your work place have an explicit structure to support mental health? Is it a common policy for all? Q4) How do you think mental health can/should be discussed openly within the workplace? Q5) How can online networks support staff especially in having a supportive ear at times of need? Following chat convention when answering a particular question please put A1… For the number question that you are answering. I have participated previously in the Mindshackles project led by Iesha Small. This helped me to vent some of my thoughts over time although it was misquoted back at me by a member of SLT during an attendance review. I have blogged extensively through this blog and also on Staffrm about my own struggles. I tweet and and share on Facebook and LinkedIn and belong to a group called #BDamigos who reach out to each other. It I look forward to leading a conversation about being a mental health sufferer and how we make it work for us or alternatively why it isn’t or hasn’t worked for us. It will be a session where sensitivity to others is key as there may be very personal sharing. I look forward to meeting all or anyone that attends. It is the first time I have set out an explicit session as a sufferer so I am intrigued about what the response will be. I hope this post has whetted your appetite, provoked some thoughts, made you want to share. If interested what I have posted previously please see the index on this blog for my mental health posts. Responses, comments on here or through other online channels are welcomed. I have been disloyal to my own blog. I apologise to myself and my readers. The link above should take you to my Staffrm profile where I have built up a log of somewhere between 130 and 140 blogposts in addition to my pieces here. Why the transfer of allegiance – some are challenging gets like blogging for each of the 29 days of February. Some because I get a larger readership and sometimes the ego likes that. So I need to re-engage with this blog and hope to do more so as I go into the new school year.